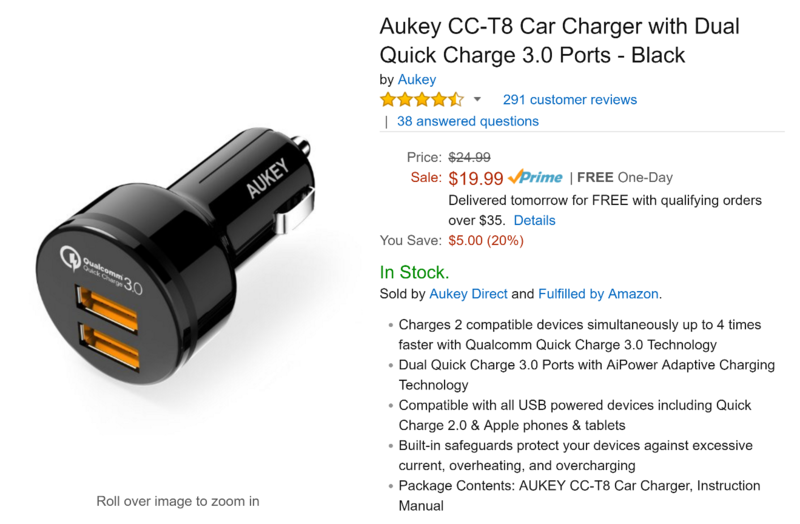 As someone who uses a car charger with Quick Charge 2.0, I can personally vouch for the usefulness of these things. Even if you've got Google Maps navigation and Bluetooth streaming on, a fast car charger will keep your phone's battery topped up without an issue. Don't have a Quick Charge 3.0-equipped device? Don't worry, your phone will still charge much more rapidly than it would with a run-of-the-mill car charger; even devices without any sort of quick charge solution on board will charge at a decent 2A. If you'd like to snag one of these for $14.99, just use offer code QC3AUCAR at checkout. That code will shave $5 off the already-decent $19.99 price tag. Amazon Prime subscribers will also get free two-day shipping. Hit the source link below to see the listing. Happy charging!